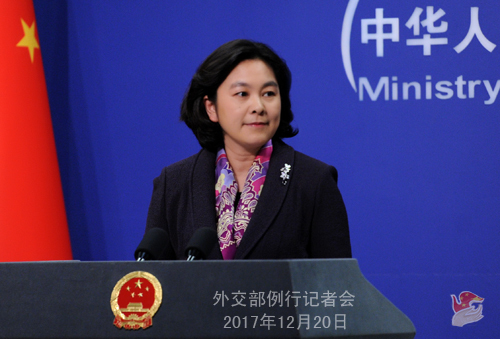 At the invitation of National Security Adviser Ajit Doval of India, member of the Political Bureau of the CPC Central Committee and State Councilor Yang Jiechi will travel to India to attend the Special Representatives' Meeting on the China-India Boundary Questions on December 22. Q: We have noted that the Foreign Ministry has issued the information that President Adama Barrow of the Gambia will visit China. Can you tell us the agenda of this visit and other details about it? A: At the invitation of President Xi Jinping, President Adama Barrow of the Republic of the Gambia will pay a state visit to China from December 20 to 26. In March, 2016, China and the Gambia reestablished diplomatic ties, which opened up a new chapter in bilateral relations. Over the past one year and more, the cooperation in such areas as politics, economy and trade, education and public health between the two countries has been in full swing and reaped gratifying achievements, which has brought tangible benefits to the two peoples. The facts have proven that the reestablishment of diplomatic relations between China and the Gambia corresponds with the trend of the times and serves the fundamental interests of the two countries and two peoples. This visit of President Adama Barrow is the first visit paid by the head of state of the Gambia since the reestablishment of diplomatic ties between the two countries. During the visit, President Xi Jinping will hold welcoming ceremony and welcoming banquet for President Adama Barrow and the two heads of state will hold talks and jointly attend the signing ceremony of cooperation documents. Premier Li Keqiang and Chairman Zhang Dejiang of the NPC Standing Committee will meet with President Adama Barrow respectively. Besides Beijing, President Adama Barrow will also visit Xiamen and Guangzhou. The Chinese side attaches great importance to the development of China-Gambia relations. We stand ready to join hands with the Gambian side to take the opportunity of this visit to further enhance mutual political trust and expand friendly and mutually beneficial cooperation across the board in a comprehensive way. Q: According to media reports, the Chinese side still bans some Chinese travel agencies from organizing group tours to the ROK. Does this measure go against the trend of the improvement of China-ROK relations? What is your comment on this? A: I haven't heard of the information mentioned by you. ROK President Moon Jae-in has just paid a successful state visit to China. The two heads of state have reached many important consensus on the improvement and development of China-ROK relations. The Chinese side holds an open and positive attitude towards the exchanges and cooperation conducted by China and the ROK in various areas. We hope that the ROK side can make concerted efforts with China to further create enabling conditions for the exchanges and cooperation between the two countries and promote the sound and smooth growth of China-ROK relations. Q: It is learned that the United States is promoting the adoption of a new DPRK-related resolution by the UN Security Council and now it is communicating with China on this. Can you offer us more details? A: As a permanent member of the UN Security Council, China has always adopted a responsible and constructive attitude to take part in the consultations and coordination on the Korean Peninsula nuclear issue within the UN Security Council. Q: According to the report of the ROK media, ROK President Moon Jae-in has proposed to the US government that the US-ROK joint military drills should be pushed back during the Pyeongchang Winter Olympic Games so as to avoid provocating the DPRK. Some ROK media said that President Moon Jae-in's remarks amount to responding to the "suspension for suspension" initiative proposed by China. What is your comment on this? A: We have noted the relevant report. Not long ago, the UN General Assembly adopted the no-war resolution during the Pyeongchang Winter Olympic Games in accordance with practice. We hope that all relevant parties can follow the spirit of this resolution to exercise restraint, demonstrate goodwill to each other, jointly safeguard the peace and stability on the Korean Peninsula, promote the settlement of the relevant issues through dialogue and consultation and also create enabling conditions and sound atmosphere for the Pyeongchang Winter Olympic Games to be held smoothly. Last week, President Moon Jae-in paid a successful state visit to China. During the talks, the two heads of state exchanged views and reached important consensus about the situation on the Korean Peninsula. The Chinese side is willing to continue stepping up communication and coordination with the ROK side on upholding stability, avoiding war and promoting peace talks. China will also continue supporting the DPRK and the ROK in improving relations through dialogue and contact and promoting reconciliation and cooperation. This is conducive to the abatement of the tensions on the Korean Peninsula and the final settlement of the Korean Peninsula nuclear issue. I would like to reiterate once again that all relevant parties should give positive consideration to the "dual-track approach" and "suspension for suspension" initiative proposed by China and try to find the breakthroughs for the resumption of peace talks as soon as possible. We are willing to continue making concerted efforts with all relevant parties to bring the Korean Peninsula issue back to the right track of peaceful settlement through dialogue at an early date. Q: First, according to media reports, the US has proposed to the UN Security Council that ten ships which are suspected of transporting prohibited articles to the DPRK should be included into the new black list. Do you have any comment on this? Second, it is reported that the US officials said that the US accused the DPRK of acting as the mastermind behind the "WannaCry" ransomware attack after serious investigations. What is your comment? Third, according to media reports, the ROK coast guards said that yesterday in the waters of the ROK exclusive economic zone, they fired over 200 bullets to expel more than 40 Chinese fishing ships after the warnings issued by them had not worked. Can the Chinese side confirm this and do you have any comment? A: Regarding your first question, the Chinese side has received the relevant proposal of the United States at the UN Security Council and now we are studying on it. As to your second question, I have noted the relevant report. In principle, the Chinese side always firmly opposes and harshly cracks down on all forms of cyber attacks. We hope that the international community can step up cooperation and dialogue and jointly address the threat posed to cyber security on the basis of mutual respect, equality and mutual benefit. With regard to your third question, I have just read the relevant report of the Yonhap News Agency. The Chinese side is highly concerned about this. The Chinese side has always attached great importance to foreign fishery administration and taken active and effective measures to safeguard the fishery production order in relevant waters. We hope that the ROK side can properly settle relevant issues, refrain from taking extreme measures that will endanger people's safety in the course of law enforcement, effectively protect the safety and legitimate rights and interests of the Chinese fishermen, and enhance communication with the Chinese side to jointly uphold the fishery production order in relevant waters. Q: We have seen that recently there have appeared some voices that question multilateralism in the world. Some countries lay great emphasis on putting their own interests first, while some others explicitly said that they uphold multilateralism. For instance, we noted that during the Italian Foreign Minister's recent visit to China, he reaffirmed this point while holding talks with Foreign Minister Wang Yi. What is your comment on this? A: Currently, the destabilizing factors and instabilities in the international landscape have been on the increase and new problems and new challenges have kept popping up. Not long ago, on the basis of gaining an insight into the trend of the world, we have put forward China's propositions and proposals on how to tackle the various challenges and problems facing the world today at the 19th National Congress of the Communist Party of China. That is building a new type of international relations and forging a community of shared future for mankind, which provide scientific answers to such questions as how to conduct state-to-state exchanges, what kind of world should be built and how to explore the future of mankind's development. Building a new type of international relations rises above the differences in nationalities, political parties and systems, brings together the greatest common denominators recognized by all countries and embodies the shared values accepted by the mankind. Forging a community of shared future for mankind echoes with the international community's aspirations and pursuits, namely longing for peace, seeking development, promoting cooperation and desiring for progress, and provides a right way of thinking for us to solve the tough problems in the fields of security and development and advance the sound development of international relations. The relevant propositions put forth by China have gained understanding and recognition from an increasing number of countries in the world. As you mentioned, the day before yesterday, when Foreign Minister Wang Yi was holding talks with Italian Foreign Minister Angelino Alfano who was paying an official visit to China, both sides stressed that they will enhance bilateral political dialogue and high-level consultations in accordance with the purposes and principles of the UN Charter and make contributions to upholding world peace, security, stability and sustainable development. They will act in keeping with the trend of globalization, stay committed to the process of multilateralism and build an open world economy. They reaffirm that it is advisable to enhance the solidarity among countries around the world, stay committed to building an international relations featuring mutual respect, fairness and justice and win-win cooperation. On this basis, a community of shared future for mankind should be jointly forged. Under the current international situations, no country can deal with the various challenges facing the mankind on its own and no country can retreat to a self-enclosed and isolated island. We stand ready to make concerted efforts with the international community to jointly address challenges, uphold peace and promote development. Q: Recently, a US government senior official said that China tires to establish its own rules and norms through the Belt and Road Initiative. What is your comment on this? A: The Belt and Road Initiative aims to advance the infrastructure building and connectivity of the countries along the route, seek greater synergy between the policies and development strategies of all relevant countries and achieve common development. The Chinese side follows the principle of extensive consultation, joint contribution and shared benefits to promote the cooperation under the Belt and Road Initiative. That is to say, all relevant countries will hold consultations on relevant matters and there is no such thing as "deciding everything by one country's say". The Chinese side has never pursued and will by no means pursue establishing the rules that are determined by one country. Since the initiation of the Belt and Road Initiative, through equal consultations, we have inked cooperation agreements with over 80 countries and organizations, carried out institutionalized production capacity cooperation with more than 30 countries and promoted the building of 75 foreign economic cooperation and trade zones in 24 countries along the route. The Chinese enterprises have invested over 50 billion dollars in countries along the route in cumulative terms and created nearly 0.2 million jobs. These figures fully demonstrate that the Belt and Road Initiative is mutually beneficial in nature and that it has received extensive support and been broadly welcomed by the countries along the route and the international community. The Belt and Road Initiative doesn't seek to establish "small cliques" and neither is it directed at any country. Instead, it is open and inclusive. We welcome the participation of all relevant parties and also hope that the relevant parties can put the advancement of the Belt and Road Initiative in perspective. Q: According to media reports, Palestinian officials said that President Mahmoud Abbas dispatched a delegation to Russia and China, calling on the two countries to support the UN-led peace talks and to play a greater role in the Palestinian-Israeli peace process. This delegation is now in Russia and part of it will travel to Beijing later to seek support. What's your comment on this? 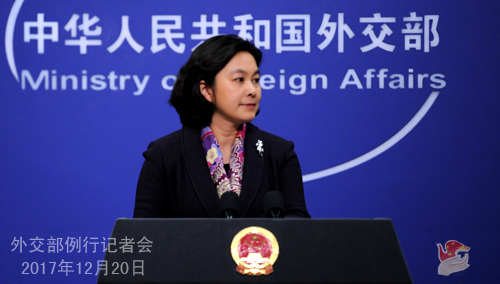 A: China will hold a symposium of Israeli and Palestinian peace advocates in Beijing from December 21 to 22. Member of the Executive Committee of the Palestinian Liberation Organization Ahmed Majdalani and Deputy Speaker of the Knesset and head of the lobby for the two-state solution Yehiel Bar will head delegations to attend the symposium. Foreign Minister Wang Yi will meet with the Palestinian and Israeli attendees. Assistant Foreign Minister Chen Xiaodong will be present at the symposium and address the opening ceremony. We hope this symposium will serve as a platform for communication and interaction between the Palestinian and Israeli peace advocates in a demonstration of the hope for peace and continue offering insights for promoting the Israeli-Palestinian peace process. Following the four-point proposal for the settlement of the Palestine issue put forward by President Xi Jinping in July this year, China will continue advancing the political settlement process based on the two-state solution and promote peace, stability and development of the Middle East. Q: Foreign Minister Jorge Arreaza of Venezuela will visit China this week. Can you tell us whether he is going to meet with Foreign Minister Wang Yi and whether he is going to meet with officials from China's financial departments to discuss the issue of financial cooperation? A: At the invitation of Foreign Minister Wang Yi, Foreign Minister Jorge Arreaza of Venezuela will pay an official visit to China from December 20 to 23. During his visit, State Councilor Yang Jiechi will meet with him and Foreign Minister Wang Yi will chair the talks. The two sides will have an in-depth exchange of views on China-Venezuela relations and issues of common concern. We believe that this visit will further enhance China-Venezuela mutual political trust and deepen mutually beneficial and friendly cooperation in all areas. As to your question on whether Foreign Minister Jorge Arreaza will meet with officials from China's financial departments, I do not have the relevant information to offer to you at the moment. But I would like to point out that the China-Venezuela financing cooperation is the commercial cooperation conducted by the two countries' financial institutions and enterprises based on the principle of equality, mutual benefit and common development. Now the relevant cooperation is being carried out smoothly. We are willing to follow the principle of equality and mutual benefit to conduct pragmatic cooperation in such areas as finance with the Venezuelan side. Q: A question on the US decision to recognize Jerusalem as the capital of Israel. There will be a meeting at the United Nations on Thursday, and the US Ambassador Nikki Haley is now warning that she will report back to President Donald Trump on the countries that will vote against the US during this meeting. Does China have any comment on that issue? A: Recently, you have all paid great attention to the discussions and voting on the status of Jerusalem at the UN Security Council. The Palestine issue is the core of the Middle East issue and it is the root cause of the Middle East peace. We call upon the international community to stay united, jointly stay committed to cooling down the situation in Jerusalem and uphold the peace and tranquility of the Middle East region and the overall picture of the Middle East peace process. China's position on the Palestine issue is consistent. We always steadfastly support and promote the Middle East peace process. We support the just cause of the Palestinian people to regain their legitimate national rights. 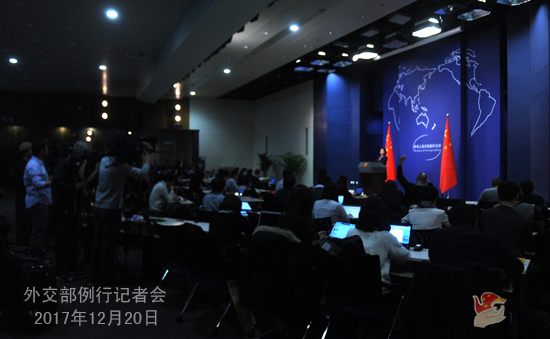 China's position in this regard will remain unchanged. Q: Since President Donald Trump announced the new South Asia policy, the Pakistan-Afghanistan relations have been in focus. It is reported that China, Pakistan and Afghanistan are scheduled to hold a trilateral meeting this month. Can you provide us with more details? A: I am not aware of the relevant information at the moment. If we have relevant information, we will release it in a timely manner. Q: According to the report of the Japanese media, the DPRK has loaded the anthrax virus into its intercontinental ballistic missile to conduct relevant tests. Can the Chinese side confirm this and what is your comment? A: I haven't heard and am not aware of the relevant information. The Chinese side always maintains that all the weapons of mass destruction including the biological weapons must be completely prohibited and thoroughly destructed. This position is quite clear-cut and firm.